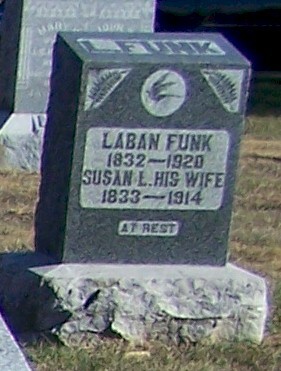 Mr. and Mrs. Laban Funk were very early settlers in southwestern Vernon County. Lisa Worley descends from this family. She has shared the information about the Funks. 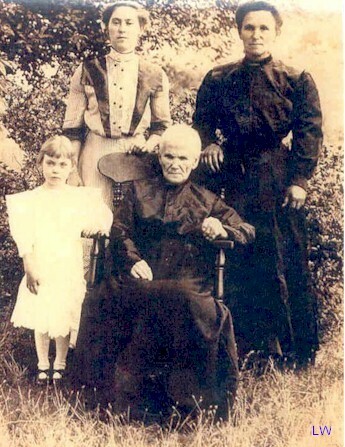 The four generations girls in the photo to the left starting from oldest to youngest are: Mrs. Susan Lavina Whitworth Funk (who is blind in this picture), Laura Ann Funk Davis, Arra Belle Davis Worsley, & Dorcas L. Worsley. This picture is taken close to Susan's death date, because Lisa's grandmother was born in 1908, & she looks about 5 years old in this picture....making it about 1913-1914. Laban Funk. He is the son of Isaac & Rebecca (Rayburn) Funk. Born July 26, 1832 in MO. He married Susan Lavina Whitworth (daughter of Samuel & Martha (Sutton) Whitworth, on Feb. 8, 1852 in Scott County, IL. His parents were from Roane County, TN. Susan was born Jan 12, 1833 in KY & died Mar. 25,1914 in MO of broncho-pneumonia. She is buried at Welborn Cemetery northwest of Moundville. If anyone has a photo of Laban, we'd like to add it here. To the left is the obituary for Laban Funk. It is from the January 14, 1920, Bronaugh Journal. You will note that Mr. Funk died of Erysipelas. Lisa suggested that since I am an animal science professor that I ought to explain what it is. Erysipelas is a hog disease caused by a bacteria. Hogs suffering from the disease have diamond shaped lesions on their backs and death losses are high. Turkeys also get erysipelas especially through a cut on the head. People that handle either a hog or turkey with erysipelas can get the disease if they cut their hand. We can assume that Mr. Funk's disease was probably on his hand. His hand and arm would have been extremely red, swollen and painful. There was no known treatment for such a disease in 1920. Grave Marker in Welborn Cemetery near Moundville for Laban and Susan Funk. One other note: Among the deceased children listed in the obituary is Sam. A Samuel Funk is listed as buried beside his parents at Welborn Cemetery but the dates are not readable. 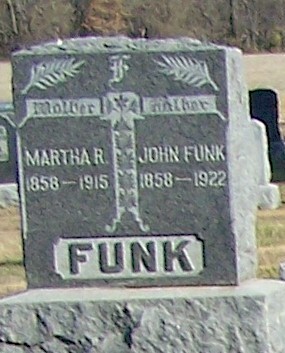 Also in Welborn Cemetery are John Funk (1858-1922) and his wife Martha (1858-1915) (middle). Martha R. was the daughter of William B. McDowell and wife Mary J. Adams. She had been born July 6, 1958, in Illinois. She died May 29, 1915 apparently at her home in Harrison Township. Her husband, John Funk, was the informant and her death certificate tells that his address was Bronaugh. Cause of death was "Carcinoma of left breast". Note - her death certificate says that burial was at Bronaugh. That is not correct - she is in Welborn.